How Does It Get Expressed And What Do We See in Patients With This? The gastroc soleal muscle takes its origin from an area just above and behind the knee. It inserts down into the back of the heel and crosses three joints. This includes the knee, ankle and subtalar joint. Most often hereditary. Runs in families. Can be acquired by people who are continuously wearing heels, which shortens the origin to the insertion of the muscle and long-term causes the muscle to shorten. Commonly seen in children with autism. Underlying neurological problems must be ruled out. This includes children with cerebral palsy. Rarely due to injury to the muscles in the front part of the leg. What would a parent or patient see or feel if their calf muscles were excessively tight? There are three ways the tightness of this muscle gets expressed in the foot, ankle, leg, and back. In an UNCOMPENSATED PATIENT WITH TIGHT CALF MUSCLES the child or adult walks almost exclusively on their toes without the heel touching the ground. The foot does not compensate or implode, as the arch stays very upright. The arch stays structurally sound because the ligaments that hold the bones together in the foot are exceptionally tight. Compensation has to occur elsewhere. This usually is present in the knee or back. The knee may hyperextend to force the center of a person’s weight more backwards because in a toe-walker it is shifted forward. If the spine compensates it will hyperextend to also shift the body weight more correctly so that we do not fall forward in walking. In a PARTIALLY COMPENSATED PATIENT WITH TIGHT CALF MUSCLES the foot ligaments are typically not as strong and the arch is not as tight. In this case the arch will slightly implode or lower. When the patient walks there will be a slight bounce in their gait. During walking there is a premature heel lift and the patient typically looks like they are “bopping”. Over time, these patients start destroying their arch. Some compensation may also occur in the knee or spine but to a lesser extent than in the uncompensated toe-walker. In a FULLY COMPENSATED PATIENT WITH TIGHT CALF MUSCLES the arch will dramatically lower or even completely collapse. These are by far the worst kinds of feet, despite the fact that it looks the best during gait as the patient’s heel touches the ground. In these children or adults the ligaments holding the arch together are very loose. During walking the tightness to the calf muscle does not allow the ankle to move as it should. Instead, all the stress goes to the arch and the arch collapses. What is seen is a flat arch and a poor ability to push off during gait. There is no bounce in their gait and they do not walk on the balls of their feet most typically. The child or adult will have a slower cadence in walking. The knee and the back are affected dramatically because the base of support is not present in such a flat foot. People with this condition often prefer more sedentary activities because of the typical fatigue that occurs prematurely during walking or activities. The ability to push off is poor and it is similar to trying to push off on sand. The foot is unable to load, lock and push off like a rigid structure should. This is because the foot is in a collapsed state and the foot functions like a loose bag of bones. It is critical to have a thorough history and physical examination of the lower extremity and spine. Neurological causes of tight muscles are always necessary to rule out. Examination of the patient while the patient is lying supine is important to evaluate a range of motion of all the lower extremity joints. This includes the hips, knees, ankles and foot joints. Evaluation of the patient standing, walking and slowly jogging gives us an opportunity to evaluate the foot strike and its position. When the foot hits the ground, we evaluate the foot progression angle (where the foot points when the patient walks), which gives us the information necessary to properly diagnose and treat the underlying problem. X-rays are always necessary to evaluate the pitch of the heel bone (calcaneal inclination angle) or the angle of the undersurface of the heel bone makes relative to the ground. 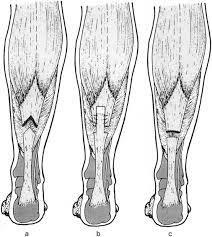 The lower the pitch, the more difficult it is to get full correction of the calf muscle tightness. Other x-ray angles are looked at to fully evaluate the alignment of all the bones and joints in the foot and ankle. When the calf muscles are tight, orthotics WILL NOT WORK EFFECTIVELY. It is critical to address the tight muscles. If we are unable to get the muscles to loosen, then the motion that is supposed to take place in the ankle will take place in the foot and orthotics will be extremely uncomfortable. 1. In patients with mild tightness of the calf muscles, a home exercise program in patients with mild tightness that encourages proper calves (gastroc stretching) may be all that is necessary to achieve loosening of the calf muscles so that the motion goes back to the ankle instead of the foot. 2. NIGHT SPLINTS are often utilized to keep the foot at a 90-degree angle while the patient is sleeping. It may be utilized in mild cases of gastric solely (calf muscle) tightness. 3. PHYSICAL THERAPY may provide some limited benefits in patients with mild cases of muscle tightness. If there is a significant amount of tightness to the calf muscle, physical therapy will be of very limited benefit. 4. SERIAL CASTING is a procedure performed to loosen the tight calf muscles. The procedure is usually performed one leg at a time so that the patient can walk as much as possible while in the cast. The procedure is usually performed by placing a hard fiberglass cast that is not removable. It is applied from an area just below the knee to the base of the toes. While putting the cast on the foot is manipulated into its neutral position to avoid a collapsing arch. All the stress goes to the ankle and calf muscle during walking and the muscle undergoes a stretching process. The more the patient walks, the more the muscle stretches. This takes place because during gait the knee expands and the muscle stretches because the calf muscle attaches above and behind the knee. Casts are usually changed every two weeks until good mobility is present in the ankle and the calf muscle is no longer tight. In mild cases this may take 2 weeks and in more advanced cases it may take 4-8 weeks. Once one extremity is finished in the casting process a custom molded orthotic is made for the foot. The other leg is then casted in similar fashion. Casting both legs at the same time does not allow the patient to walk with knee extension; therefore, IT DOES NOT WORK. THE KEY WITH SERIAL CASTING IS TO HAVE THE PATIENT WALK AS MUCH AS POSSIBLE AND RESUME ALMOST ALL ACTIVITIES EXCEPT RUNNING AND JUMPING. When the casting is complete, night splints are used for a period of time to maintain the correction. 5. ACHILLES TENDON LENGTHENING SURGERY may be necessary in cases in which the calf muscle is exceptionally tight and the arch is completely collapsed. One of the most important procedures that we perform in our practice is to lengthen the calf muscle or Achilles tendon when serial casting or other measures have failed. The Achilles tendon lengthening procedure is done on an outpatient basis under a twilight or general anesthetic. Three small incisions in the back of the Achilles tendon are made, all 1/8” in length. The incisions are separated by 2.5 to 3 cm. One stitch is placed in each one of the incisions. A cast is applied postoperatively and the patient is non weightbearing for 6-8 weeks. Night splints are often utilized once the cast is removed and the patient begins physical therapy. This procedure is usually done with other procedures at the same time such as an “arthroeresis” or implant placed in the side of the foot to correct a flat foot. Full recovery can take three or more months. 6. GASTROC RECESSION is a procedure that is performed just below the calf muscle. Selective leg lengthening of the gastric aponeurosis is made to lengthen the calf muscle. Postoperatively patients are placed in a cast which is non weightbearing for 4-6 weeks. Night splinting follows cast removal and the patients begin to weight bear and start physical therapy in a boot. The procedure is often performed with other procedures to correct other deformities such as an “arthroeresis”, which helps correct a flat foot and other deformities. THE CHOICE BETWEEN DOING AN ACHILLES TENDON LENGTHENING OR A GASTROC RECESSION IS MADE BY DOING A THOROUGH PHYSICAL EXAMINATION TO IDENTIFY WHERE THE MUSCLE TIGHTNESS EXISTS. IF IT IS IN THE GASTROC ALONE A GASTROC RECESSION IS BEST. IF IT IS IN BOTH THE GASTROC AND SOLEUS, THEN THE ACHILLES TENDON LENGTHENING MAY BE A BETTER PROCEDURE. The recurrence rate is slightly higher when performing the casting in patients younger than six years old or in patients who have an underlying neurological cause. If after an evaluation and x-ray exam we determine that the patient is a good candidate for casting (which is most often the case), the prognosis is excellent. We have performed serial casting more than 1,000 times with excellent short, medium and long-term results. There is a 15-20% chance of a mild recurrence of the tightness after the casting 6 or more months after the procedure. The recurrence rate is slightly higher when performing the casting in patients younger than 6 years old. It is still the best procedure to perform and if necessary can be done again. After a thorough evaluation and x-ray examination, we are clearly able to determine which patients will do best with different treatment options. Patients that are extremely flatfooted with a low calcaneal pitch are often the most difficult to treat. Many of these children, teens, and adults may require a percutaneous lengthening of the Achilles tendon or open lengthening of the gastric muscle, a gastroc recession. The prognosis following these procedures if necessary is excellent. These procedures are usually performed with other procedures at the same time to fully correct a flatfoot deformity if present. Night splints are often necessary for 1 or more months after the casting or surgical procedure. Orthotics are almost always necessary to keep the heel bone aligned with the lower leg. Physical therapy postoperatively helps to fully rehabilitate the lower extremity. This aids in returning the patient back to activities of daily living or sports activities.